The new Quinny Moodd is poetry in motion. This ultra modern and complete pushchair system offers the flexibility to get the most out of your day, everyday. Its easy to fold for compact transportation and at the push of a button, it automatically unfolds in seconds. 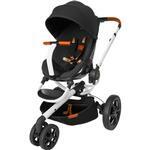 Adaptable, complete and stylish, youll always be able to go wherever the Quinny Moodd takes you, your way.